Order in next 3 hours and 47 minutes for despatch today. 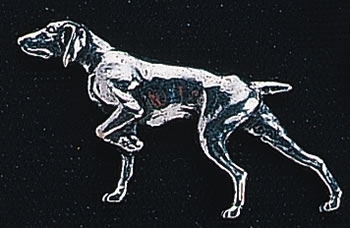 Home | Gifts | Pewter Badges | Pewter Badges Depicting Breeds of Dog. Pewter badges made in England and ideal for putting on the corduroy collar of your Barbour jacket. All our badges are styled after the works of T. S. Brown. All badges approximately 1 3/4 inches square. This example shows a Pointer, a great gift for the dog lover in your life. We have other dog breeds available, just call and ask on +44 1494 775577.